To grow seeds and cultivation process is not an easy task as it needs a lot of hard work. After working so hard and long the climatic conditions can ruin everything. Now, it is essential for the farmers to have a rescue from these challenges. The internet of things technology has played a vital role here. Let’s us know how the internet of things in agriculture is beneficial. The agriculture industry has been facing various challenges for years. It has been a very important part of human lives as it fulfills our basic requirement – food. Without food, we can’t even imagine our lives. But then also, this industry use to face a high level of risk. The farming industry is so complex. Hence, the invention of the Internet of things has turned agriculture into smart agriculture. Now, many new tools, technologies, and gadgets have become a part of this industry to sort out real challenges. With the motive, to take the agriculture economy to the next level, IoT Application in Agriculture has been introduced. Now, the latest and innovative gadgets like Apple watch, Self-driving cars, and Google Glass has become a vital part of this industry. As now this industry can also be driven by mobile applications which are developed specially for the Agri sector and it has shown a huge impact on it. Hence, it sorts out many challenges in the agriculture industry, which results in the increasements in the quality and quantity at an affordable price. Process Automation: The automation held to the wide sectors which includes irrigation and fertilization. Waste Reduction: By implementing the IoT technology, the quantity of waste get reduce as everything used to be in a proper and organized way, so there is no chance of getting the crops ruined. 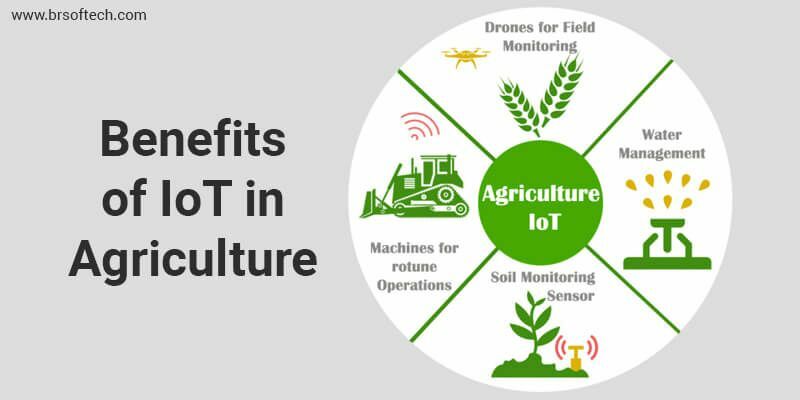 How IoT works in the Agriculture industry? Now many advanced techniques have also introduced in the filed. On the basic level, the sensors use to integrated into the hardware or in the machinery system. It helps to track the actual status of the growing seeds. It helps to provide a large quantity of data and keeps the data in an organized way without any error the actual number of facts and figures use to revealed. The information includes the number of seeds plant, storage condition, a variety of insightful data, the status of farming equipment and machinery used. The IoT software development services help farmers to know the weather conditions and it enhances the decision. Precision Farming: This application has been popular in all over the sector and, it has been used in a wide range by the organizations. This type of farming helps to control the growth of crops and livestock process. The key components of precision farming include a control system, robotics, automated hardware etc. Agriculture Drones: Agriculture drones is the most useful and essential part of the industry. It makes the process accurate for the farmers and helps to monitor the actual condition of the crops. It is helpful in many other ways also which include planting, irrigation, crop monitoring, crop health assessment, and soil and field analysis leads to the result in easy to use and time-saving. It has the ability to increase yields. This app is useful for farmers who are dealing widely in the agriculture sector. It helps to prevent to spread virus and infection. If any bird or animal is caused by any disease, so with its monitorization it gives signal and farmer can immediately take an action on it and keep it separately from the other animals. The smart greenhouses App not only monitors the climate but also monitors it in a proper way. It includes the intervention of human beings. It works on the cloud server and has access to the remote. The advent of technology internet of things has taken the agriculture sector one step forward to the modernization and digitalization, which makes the agriculture process easy. It helps in many ways and provides relief to the farmers. The IoT development company putting it’s high efforts to bring more advanced technologies and to sort more challenges with one click.